In order to use the Agent to Agent chat, navigate to the bottom left side of the Dashboard. You will see the Agent Chat Menu there. 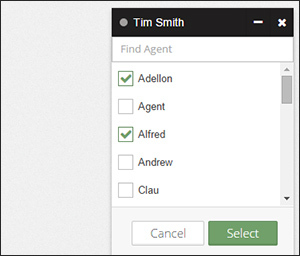 Click the small plus sign to expand the list of Agents. Click the small minus sign to contract the menu. Agents with a green circle to the left of their name are logged into Tawk.to. Agents with a grey circle to the left of their name are in invisible status and you won’t be able to chat with them. Agents with a red circle next to their name are offline and also won’t be available for agent to agent chat. Click on the Agent you would like to chat with and a small chat window will open on the bottom right side of the dashboard. 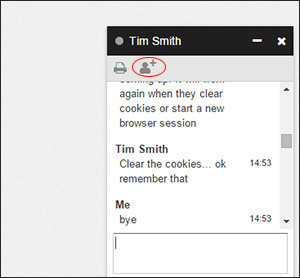 To add additional agents to the chat (Group Chat) simply click the agent + icon you see circled in the image above. 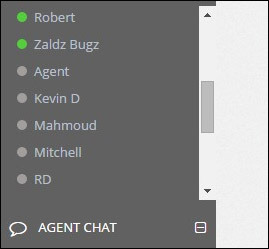 This will open the screen you see below and you can add additional agents to the chat for a group discussion.